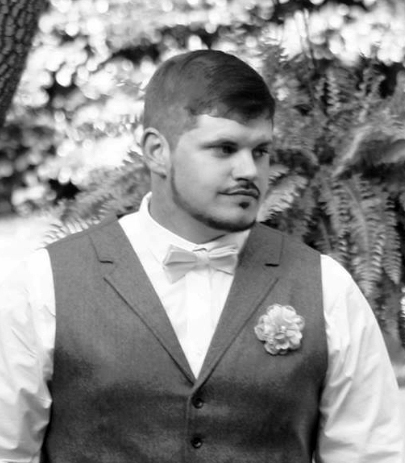 North Augusta, SC – James Pierce “J.P” Hatcher, II, 25, husband of Mrs. Hollynd Dyches Hatcher, of North Augusta, entered into rest on Sunday, August 7, 2016. He was preceded in death by his paternal grandfather, Pierce Hatcher. J.P. was a 2009 graduate of Fox Creek High School, Edgefield, SC where he played golf, football and baseball. He was a veteran of the United States Army. He was a member of the Sheet Metal Workers International Union and he worked for Bridgestone. J.P. enjoyed fishing and weight lifting but he mostly loved being a Dad and Husband. Surviving with his wife Hollynd Dyches Hatcher and his son, Caiden Allen Hatcher, both of North Augusta, SC; are his parents, Ken and Theresa Hatcher, Trenton, SC; paternal grandmother, Betty Cleckley Hatcher, Warrenville, SC; maternal grandmother, Donnis Strickland, Gulf Shores, AL; maternal grandfather, James L. Strickland, Winnsboro, SC and his sister, Krystal Hassett (Sean), Hope Mills, NC. A memorial service will be held on Friday at 1 o’clock at Sweetwater Baptist Church with Reverends Jimmy Grider, Keven McMahan and Wes Holbrook officiating. The family will greet friends one hour prior to the service at the church. Please visit HatcherFuneralHome.com to leave a memory and a note of condolence for the Hatcher Family. In lieu of flowers, memorials may be made to the: J.P. Hatcher Memorial Fund, c/o Wells Fargo Bank, for Caiden Hatcher’s College Fund. Hatcher Funeral Home and Cremation Service, 3464 Jefferson Davis Highway, Graniteville, SC is assisting the Hatcher family.